Updated on April 11, 2016: The band has added additional North American tour dates. The tour is now set to kick off May 24 and extend until July 25. You can find the ticketing information below. In 2015, a new hard rock supergroup featuring Alice Cooper, Aerosmith guitarist Joe Perry, Guns N’ Roses bassist Duff McKagan, and actor / guitarist Johnny Depp formed and released an album. Calling themselves the Hollywood Vampires, the name is in dedication to all the group rock stars including Cooper, Keith Moon, and Ringo Starr that would hang out at L.A.’s famed Rainbow Room bar in the ’70s. They’ve already released their debut album, and now, they’ve announced 2016 tour dates. 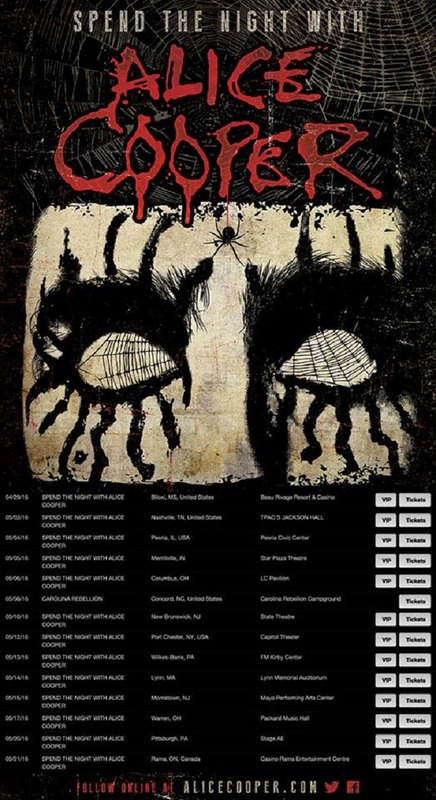 This is in addition to Alice Cooper’s 2016 tour plans and Duff McKagen’s tour plans with the partially reunited Guns N’ Roses. We have to carefully schedule the Vampires… That’s because you have Johnny’s movie schedule; you’ve got Aerosmith, you’ve got Guns N’ Roses and you’ve got me! It’s five entities going in five different directions. To get those guys all at one time when we’re not working is really unique. So everybody looks at their calendar, and you have to find that two weeks where everybody’s off. WHEN DO HOLLYWOOD VAMPIRES 2016 TOUR TICKETS GO ON SALE AND WHAT IS THE PRESALE CODE? Live Nation, LN Mobile App, Ticketmaster, and local radio / venue presales begin April 13. The general public on-sale begins as early as April 15, 2016. The Live Nation presale offer code is BACKSTAGE and the LN Mobile App password is COVERT. We suggest you sign up for the Hollywood Vampires’ free email newsletter (bottom of page) as well as following them and your local venue on social media to get the most up-to-date information. Details are subject to change, and each date can be different. Click the links below to buy tickets for the show you’re interested in. For the latest music, news, and tour dates from the Hollywood Vampires, check out their Zumic artist page.